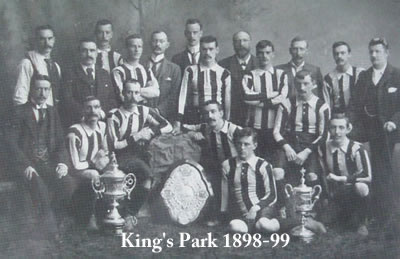 In season 1898 to 1899 King's Park were in the second year of the Central Combination League and finished the season third bottom after twelve matches.They did however win the Stirlingshire Cup that season, which qualified them for the newly formed Dewar Shield competition and they went on to become the first winners of the Dewar Shield. The photograph below shows both trophies and the local Charity Cup. Images Copyright Historical Football Kits and reproduced by kind permission. Historical Football Strips of King's Park. A record of the matches played to reach the final is listed below. The final of the Stirlingshire Cup took place on a very windy day and, having won the toss, the King's Park captain James Mirk chose to play with the wind in the first half so Camelon kicked off the game playing into the wind. His choice was to prove correct as King's Park took a four goal lead to half time. In the second half Camelon were not able to use the conditions as well as King's Park had done and only managed to score two goals in reply. At the end of the game, both teams and their officials retired to the Red Lion Inn in Bainsford for tea with the President of the Stirlingshire Association Mr Lindsay presiding.In handing over the trophy, He stated that King's Park had won the right to participate in the Dewar Shield competition by being successful here. Mr T.W.R. Johnston accepted the cup on behalf of the King's Park President McKerchar who was absent owing to illness. On returning to Stirling Station by train, the team, officials and the cup were met by large crowds. An open top double decker bus took them all up Station Road, Murray Place and King Street to the Arcade entrance, preceded by Stirling Brass Band. From high up on the open top of the bus the players and the cup received an enthusiastic welcome from the crowd.